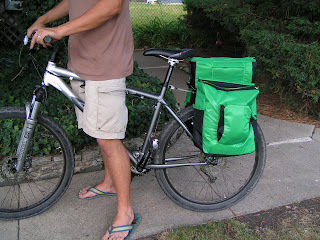 They will be used for some long-distance cycling camping trips, or when the VW breaks down. If we are in Alaska and the VW breaks down in the middle of nowhere, at least we can pack a day's worth of food and water and other supplies and bike to the nearest town and get help!!! They don't touch the back wheel because of a rack which is holding everything in place. 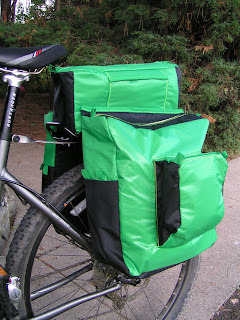 The bags have a wooden backing plate which is attached to the rack.